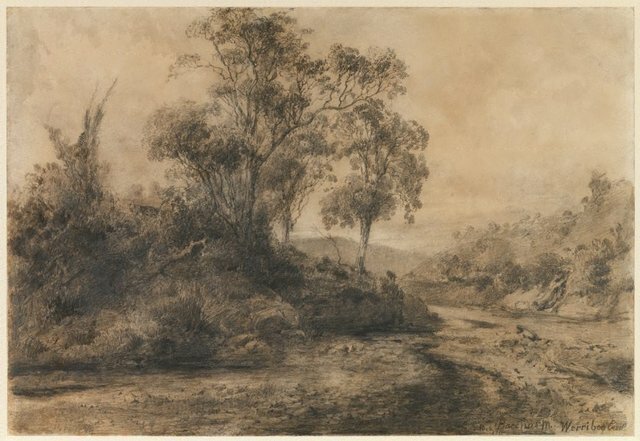 In spite of its humble focus on foreground and scrubby trees, 'Bacchus March, Werribee Creek' is a drawing of understated grandeur. A relatively large drawing for Buvelot, it was doubtless intended for exhibition as a finished work. The intensity of Buvelot's involvement in his subject is obvious - it is a drawing of a scene most would overlook. The drawing has a quiet mystery; the experience it gives of a curving dirt path underfoot, a mound of earth with scrub directly ahead and distant hills and grey, atmospheric sky is both absorbing and satisfying. It represents a solitary moment of reflection when seemingly unspectacular everyday experience becomes poetic and memorable. Signed and dated l.r. corner, pencil "LB .6/ 1876/ ...".